Received: June 15, 2018; Revised: August 25, 2018; Accepted: August 27, 2018; Published online: December 15, 2018. Intussusception is a common cause of intestinal obstruction in children. While most patients can be treated by enema reduction, about 20% require surgery. We investigated the usefulness and feasibility of laparoscopic surgery and the intraoperative risk of bowel resection. We retrospectively reviewed pediatric patients who underwent surgery for intussusception from 2010 to 2017. We collected data for age, gender, body weight, associated symptoms, duration of symptoms, white blood cell count, operating time, and postoperative complications. Of 155 patients, 37 (23.8%) underwent surgery due to enema reduction failure in 29 (78.3%), recurrence in 6 (16.3%), a suspicious lead point in 1, and suspicious ischemic change observed on ultrasonography in 1. The mean age was 26.8±18.9 months (range, 3.5~76.7 months), and the mean body weight was 12.9±3.9 kg (range, 5.4~22.2 kg). Laparoscopic surgery was successful in 29 patients (78.4%), and 7 (18.9%) needed bowel resection and anastomosis. The mean operating time was 56.7±32.8 min. A lead point was found in 3 patients in the bowel resection group (p=0.005); in addition, the operating time and hospital stay were longer in this group. There were no intra- or postoperative complications. Laparoscopic surgery was successful in 78.4% of the patients with a short hospital stay and early oral intake. The only predictive factor for bowel resection was the presence of a lead point. Laparoscopic surgery may be an optimal treatment intervention for children with intussusception, except for those who show initial peritonitis. Currently, the standard treatment for intussusception is enema reduction using air, barium, saline, and other such agents. Following the work of Ravitch and McCune, success rates of 79~90% have been reported.7 Nevertheless, about 20% of the patients require surgery due to failure of reduction, clinical signs (peritonitis, shock/sepsis, and pneumoperitoneum), or the presence of a lead point.3,5,6 Traditionally, manual reduction during laparotomy was performed; laparoscopic procedure was attempted in the late 1990s. However, despite advanced minimally invasive surgery (MIS) technology, the reported success rate of the laparoscopic procedure is less than 50%.8 This has impeded the widespread implementation of MIS, and its value in intussusception treatment remains a matter of debate. Since 2010, laparoscopic surgery has been the first choice of treatment for children with intussusception in our institution. The aims of this study were to investigate the usefulness and feasibility of laparoscopic surgery and the risk of bowel resection during laparoscopic reduction of intussusception. We retrospectively reviewed pediatric patients who underwent surgery for intussusception in Haeundae Paik Hospital and Dong-A University Hospital from April 2010 to December 2017. After diagnosis, enema reduction using air or barium was attempted initially, except in the patients who showed peritoneal irritation, which required an emergent operation. Enema reduction was performed by a skilled radiologist, with pressure not exceeding 100~120 mmHg. After successful reduction, the patients were hospitalized for more than 1 day. However, surgical intervention was indicated in cases when enema reduction was impossible, a suspicious lead point was present, or intussusception recurred more than 3 times. We performed laparoscopy using 3 trocars (usually, one of 5mm umbilical trocars with two 3-mm trocars; 5-mm trocars if the patients were older than 5 years). The trocars were placed in the umbilicus, the left lower quadrant, and the suprapubic area. The intra-abdominal pressure was kept below 10 mmHg. After identifying the intussusception lesion, we reduced the intussusception using 2 atraumatic intestinal clamps and examined the proximal small bowel to look for a possible lead point. If it was impossible to reduce or we found a suspicious lead point or bowel injury, the procedure was changed to laparotomy. Usually, we extended the incision of the umbilicus in a semicircle and performed either intussusception reduction or bowel resection and anastomosis (Fig. 1). Data was collected for age, gender, body weight, associated symptoms, duration of symptoms, white blood cell count, operating time, and postoperative complications. This study was approved by the local institutional review board. To determine the risk factors for bowel resection, we analyzed categorical variables using the Chi-square test and Fischer’s exact test using IBM SPSS Statistics software (version 20 for Windows; SPSS Inc., Chicago, IL). Continuous variables were compared using the two-tailed t-test for normally distributed variables. A p value <0.05 was considered significant. During the study, intussusception was confirmed in 155 patients, and reduction was attempted 195 times. Of the 155 patients, 37 (23.8%; 24 male and 13 female) underwent surgery due to enema reduction failure in 29 (78.3%), recurrence in 6 (16.3%), a suspicious lead point in 1, and a suspicious ischemic change observed on ultrasonography in 1. Twelve patients (32.4%) were transferred for operation due to failure of reduction. For the stable patients, we attempted another trial of air reduction, but they ultimately underwent the surgery. The mean age was 26.8±18.9 months (range, 3.5~76.7 months), and the mean body weight was 12.9±3.9 kg (range, 5.4~22.2 kg). All patients except 8 (78.4%) underwent successful laparoscopic surgery; however, 7 (18.9%) needed bowel resection and anastomosis. The type of intussusception was ileocolic in 29 patients (78.4%) and ileocecal in 8 (21.6%). The causes of conversion were irreducible intussusception in 4 patients, a lead point in 3, and a small bowel injury to the muscle layer during reduction in 1. As shown in Figure 1, we pulled out the bowel through an umbilical incision and performed manual reduction or bowel resection. After surgery, the umbilical scar was not visible (Fig. 2). Associated symptoms were irritability or abdominal pain (n=27; 73%), vomiting (n=22; 59.4%), hematochezia (n=11; 29.7%), and fever (n=6; 16.2%). The duration of symptoms was variable: 15 patients showed symptoms for up to 24 h, 8 between 24 and 48 h, 6 between 48 and 72 h, and 8 visited the hospital over the course of 3 days after symptom onset. The mean white blood cell count (per mm3) was 12,094.4±4,576.1 (range, 1,110~21,870). The mean operating time was 56.7±32.8 min (range, 17~180 min), and lead points were found in 3 patients: heterotopic pancreas, angiodysplasia, and Meckel’s diverticulum. Oral intake started from the day after surgery, except in those patients who underwent intestinal resection; they started oral intake after flatus. There were no intra- or postoperative complications. The mean hospital stay was 5.4±1.89 days (range, 3~10 days) (Table 1). The mean follow-up period was 96.6±68.4 months (range, 3.5~215.9 months). One patient had a recurrence after surgery and was treated with air reduction. The mean age of these 7 patients was 14.8±15.9 months (range, 3.5~41.5 months), of which 4 (57.1%) were younger than 6 months and 2 were older than 34 months. The duration of symptoms was not longer than that of the reduction group. Abdominal pain or irritability was common in the reduction group and vomiting or hematochezia was common in the bowel resection group, but the difference was not significant. A lead point was present in the bowel resection group only (p=0.005). The operating time (43.8±12.1 vs. 112±36.8 min, p=0.003) and mean hospital stay (4.8±1.4 vs. 8.1±1.1 days, p<0.001) were longer in the bowel resection group. The white blood cell count (per mm3) showed no significant difference between the 2 groups (Table 1). Surgical treatment of intussusception is primarily required for patients when enema reduction fails and peritoneal irritation signs are present. The known predictive factors for surgical treatment include age, duration of symptoms, length of the intussusception, and the presence of a lead point. Fallon et al. reported that the use of hydrostatic enemas for reduction, failure of initial enema reduction, hematochezia, age <1 year, or symptoms for >48 h were associated with the need for surgery.3 They also found that 26% of the patients required operative management, despite several trials of enema reduction. Multiple enema reduction attempts succeeded only in 8% of the patients, and the success rate decreased after each attempt. Ultrasound findings, including a definable lead point, free or inter-loop fluid, and bowel wall thickening, were predictive factors for surgery.3 Savoie et al. reported a success rate of 79% with enema reduction in 7,412 patients. However, it was unsuccessful in the older age group because of the presence of a pathologic lead point.5 Bratton et al. found that patients who were treated at a children’s hospital were less likely to undergo surgery compared with those treated at a non-children’s hospitals.9 Overall, despite aggressive enema reduction, about 20% of the intussusception cases require surgical intervention. In these cases, we need to find the best cure for the children. In our experience, reduction using an atraumatic bowel grasper is always challenging. Manual reduction of a tight intussusception is also difficult during laparotomy, as it requires increased traction strength, which can cause intestinal tearing or perforation. In contrast, MIS has a significant limitation with regard to tactile sensation and strength delivered, which we believe is the reason for the low success rates in the early period and why many surgeons do not consider it a first choice. In the present study, surgical treatment was required in 23.8% of the patients, and MIS was successful in 78.4% of the patients. Similar results have been reported in recent studies.3,16–19 The patients in this study underwent reduction 1.97 times (mean) before surgery, and a lead point was found in 8.1% of the patients. Wei et al. reported a 13% conversion rate from laparoscopic procedure to laparotomy, which was more common in cases with a long intussusception.17 Bonnard et al. reported that the risk factors for conversion to laparotomy were directly related to delayed diagnosis (1.6 vs. 3.1 days), symptomatic peritonitis, and the presence of a pathologic lead point.14 While the bowel resection group in that study tended to be younger than the reduction group, we did not find a significant difference in this study. The youngest patient was 3.5 months old, and 3 patients were 5 months old. Park et al. reported that infants aged less than 5 months may present with nonspecific gastrointestinal symptoms without hematochezia, which can delay diagnosis.20 However, this was not the case in our study. Unexpectedly, the duration of symptoms was less than 24 h in 40% of patients. Only pathologic lead point was a risk factor for bowel resection in this study, which is consistent with the findings in recent reports.8,18 Overall, we believe that laparoscopic surgery is worth attempting in patients who have had symptoms for more than 48 h and who do not show peritonitis. In previous studies comparing MIS and laparotomy, there was a statistically significant decrease in the duration of the hospital stay and analgesic requirements in MIS group.10,21–23 When Wei et al. compared a laparoscopy group and a laparotomy group, the operating time was longer in the laparoscopy group, but the time to oral intake and hospital stay were significantly shorter compared with the laparotomy group.17 In the present study, we did not perform a comparison with laparotomy. However, the fact that a patient who underwent laparoscopic procedure can eat the day after the operation is a clear advantage of laparoscopic surgery over laparotomy. MIS is advantageous for patients who show spontaneous intussusception reduction after a failed enema reduction. Approximately 10~13% of such cases were found after general anesthesia;17,18,24,25 the associated smooth muscle relaxation may be a possible cause.17 In this study, we also observed 10.8% cases of spontaneous reduction. In these cases, laparoscopic procedure with a small incision may be beneficial. The reported recurrence rates are 5%~13% after nonsurgical treatment for intussusception and 1%~3% after surgery.23 Cheung et al. reported recurrence in 1 of 15 patients (6.6%),21 and Kia et al. reported recurrence in 1 of 16 patients (6.25%).10 In this study, we observed recurrence in 1 patient (5.4%). However, we did not compare the recurrence rate between laparoscopic procedure and laparotomy, and further investigation is necessary. This study had several limitations. Many patients were referred for surgery in a tertiary children’s hospital, and the incidence of surgery was calculated to be higher than it actually was. Moreover, since the number of cases was insufficient to compare the bowel resection and reduction groups, the predictive factors for the bowel resection group were not evident. Nevertheless, this was a meaningful study by a single pediatric surgeon who has many years of experience in MIS. Laparoscopic surgery for the treatment of intussusception was successful in 78.4% of the patients, and the single predictive factor for bowel resection was the presence of a lead point. Laparoscopic surgery proved to be safe and had excellent cosmetic results with a short hospital stay and early time to oral intake. Excluding patients with peritonitis symptoms or severe abdominal distension with ileus, laparoscopic surgery can be considered a first-choice option for intussusception. In cases of irreducible intussusception, bowel or mesentery injury requiring repair, or the presence of lead points, we should not hesitate to convert to laparotomy. Fig. 1. 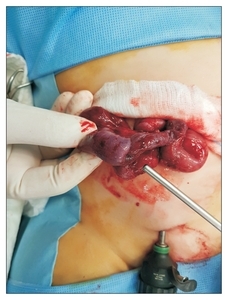 Conversion to laparotomy for irreducible intussusception through umbilical incision. Fig. 2. The photograph of postoperative wound after 7 days. All values are number (%). Parashar, UD, Holman, RC, and Cummings, KC (2000). Trends in intussusception-associated hospitalizations and deaths among US infants. Pediatrics. 106, 1413-1421. Seifarth, FG, Ryan, ML, Triana, J, and Knight, CG (2011). Diagnosis and laparoscopic treatment of ileoileal intussusception secondary to heterotopic pancreas in an infant: case report and review of the literature. J Pediatr Surg. 46, e33-e36. Fallon, SC, Lopez, ME, and Zhang, W (2013). Risk factors for surgery in pediatric intussusception in the era of pneumatic reduction. J Pediatr Surg. 48, 1032-1036. Arbizu, RA, Aljomah, G, Kozielski, R, Baker, SS, and Baker, RD (2014). Intussusception associated with adenovirus. J Pediatr Gastroenterol Nutr. 59, e41. Savoie, KB, Thomas, F, Nouer, SS, Langham, MR, and Huang, EY (2017). Age at presentation and management of pediatric intussusception: A Pediatric Health Information System database study. Surgery. 161, 995-1003. Ha, H, Cho, J, and Park, J (2014). Risk Factors Associated with the Need for Operative Treatment of Intussusception in Children. J Korean Assoc Pediatr Surg. 20, 17-22. Ravitch, MM, and McCune, RM (1948). Reduction of Intussusception by Barium Enema : A Clinical and Experimental Study. Ann Surg. 128, 904-917.
van der Laan, M, Bax, NM, van der Zee, DC, and Ure, BM (2001). The role of laparoscopy in the management of childhood intussusception. Surg Endosc. 15, 373-376. Bratton, SL, Haberkern, CM, Waldhausen, JH, Sawin, RS, and Allison, JW (2001). Intussusception: hospital size and risk of surgery. Pediatrics. 107, 299-303. Kia, KF, Mony, VK, and Drongowski, RA (2005). Laparoscopic vs open surgical approach for intussusception requiring operative intervention. J Pediatr Surg. 40, 281-284. Schier, F (1997). Experience with laparoscopy in the treatment of intussusception. J Pediatr Surg. 32, 1713-1714. Hay, SA, Kabesh, AA, Soliman, HA, and Abdelrahman, AH (1999). Idiopathic intussusception: the role of laparoscopy. J Pediatr Surg. 34, 577-578. Fraser, JD, Aguayo, P, and Ho, B (2009). Laparoscopic management of intussusception in pediatric patients. J Laparoendosc Adv Surg Tech A. 19, 563-565. Ntoulia, A, Tharakan, SJ, Reid, JR, and Mahboubi, S (2016). Failed Intussusception Reduction in Children: Correlation Between Radiologic, Surgical, and Pathologic Findings. AJR Am J Roentgenol. 207, 424-433. Park, BC, Kim, SY, and Jung, SJ (2005). A Comparative Analysis of Clinical Features and Treatment Outcomes of Intussusception according to Age Distribution. Korean J Pediatr Gastroenterol Nutr. 8, 150-156. Cheung, ST, Lee, KH, and Yeung, TH (2007). Minimally invasive approach in the management of childhood intussusception. ANZ J Surg. 77, 778-781. Bailey, KA, Wales, PW, and Gerstle, JT (2007). Laparoscopic versus open reduction of intussusception in children: a single-institution comparative experience. J Pediatr Surg. 42, 845-848. Almaramhy, HH (2011). Laparoscopic reduction of intussusception in children: role in primary and revisional reduction after failed nonsurgical therapies. Int J Health Sci (Qassim). 5, 71-78. Kornecki, A, Daneman, A, Navarro, O, Connolly, B, Manson, D, and Alton, DJ (2000). Spontaneous reduction of intussusception: clinical spectrum, management and outcome. Pediatr Radiol. 30, 58-63.